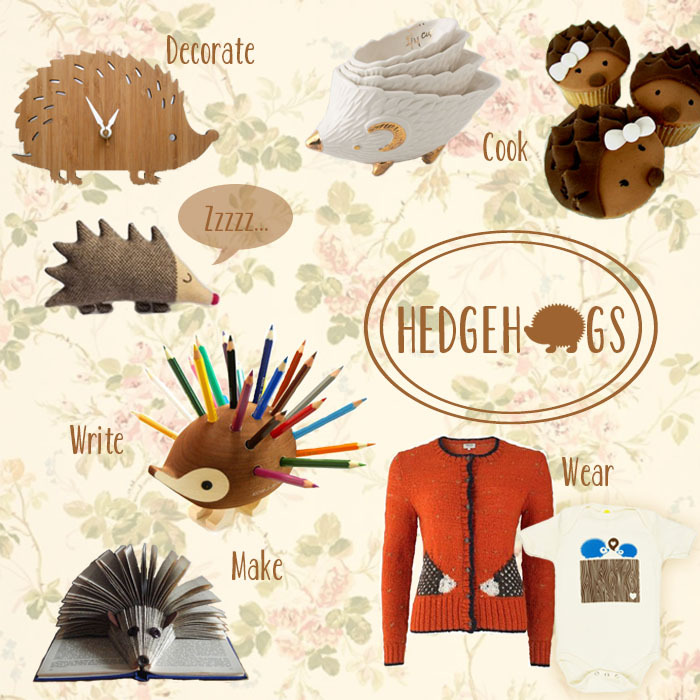 We are wild about hedgehogs here on Prudent Baby. Between Jaime’s Anthropologie measuring cups and the hedgehogette cupcakes I want to make (with the hedgehog measuring cups, of course), there will be hedgehogs coming out of our ears. Hedgehogs are making a statement in home decor with pillows and clocks. They are strolling through the fashion world on onesies and sweaters, and kickin’ it on school desks as pencil holders and books. There’s no way to resist bringing hedgehogs into your life when you see how cute a real baby hedgehog can be. They make great pets too! I love them too! We are decorating a new nursery for our second little one due in April. The theme has been ‘real life Bambi’ but I keep buying hedgehog things. Did you see that Scentsy has a new hedgehog Buddy coming out in March? I just called to order it yesterday, sooooo cute!! I just made hedgehog cupcakes for my daughters first birthday. Were was all this stuff when I was looking for decorations?? I did find some cute hedgehog fabric though. The little hedgehog pencil holder is super cute!